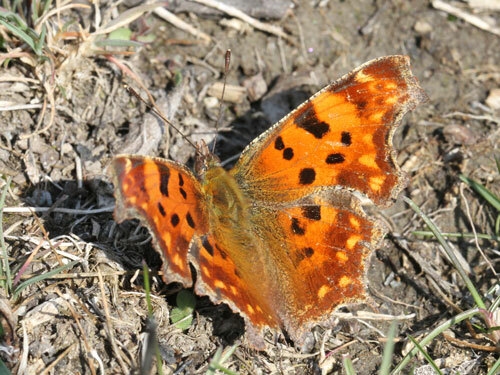 One of the earliest species to come out of hibernation. 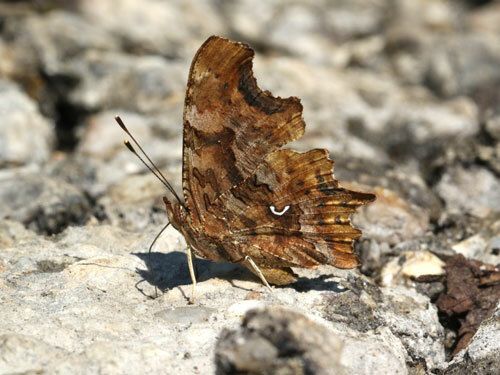 The scalloping of the wing effectively breaks up the typical wing shape, the butterfly closely resembles a dead leaf. 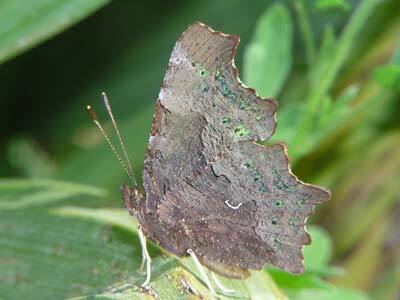 Identification & Similar species: The highly scalloped wings resemble a dead leaf. 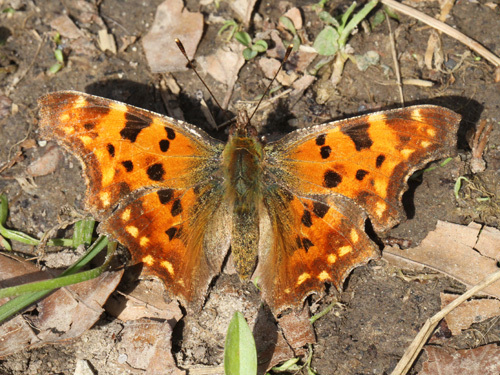 The upperside is orange brown with darker tawny spots. 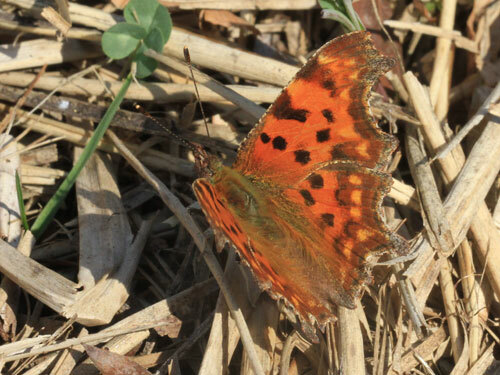 The only similar species is the southern comma, P. egea. 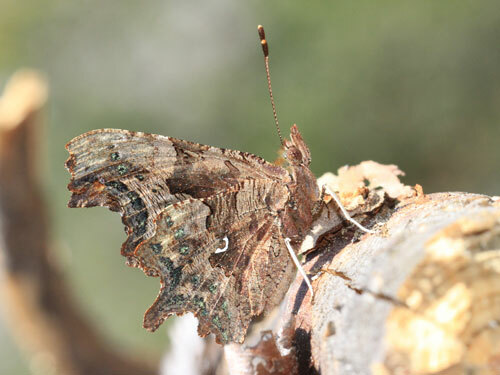 Amongst other features, the species are separated by the "comma" vs "v" shape of the white underside hindwing marking, an underside rather dark and mottled with moss-coloured green tints vs pale beige with fine brown steaks and a deeply scalloped inner margin to the forewing vs a shallow curve. 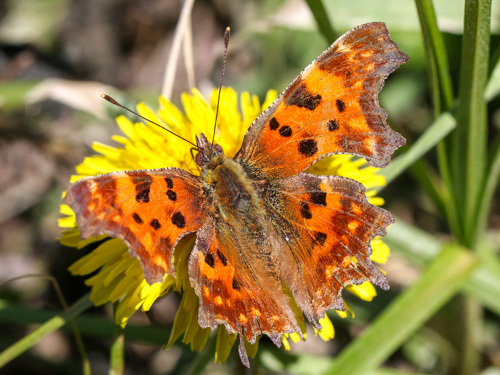 Distribution & Flight: Much of France and eastwards across Central Europe to south Finland, extremely local in north Spain. 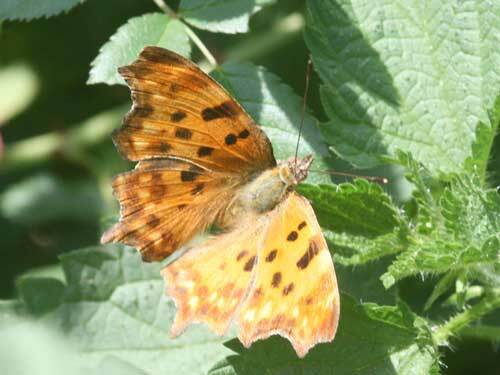 Occasionally common where found, more usually at low density. 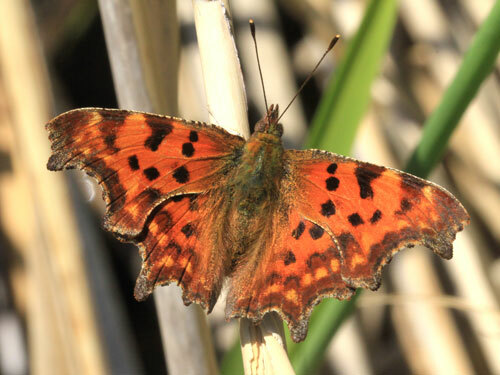 Hibernated specimens fly from March to May. The first generation emerges in June/ July. 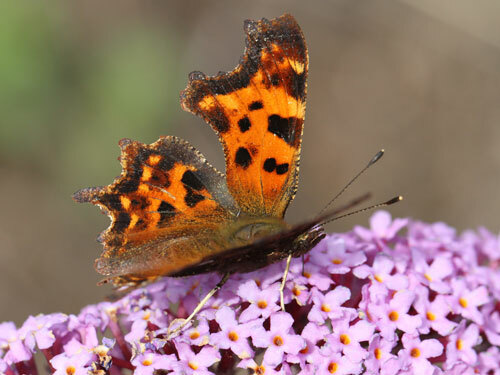 Some adults of this generation hibernate, others go on to breed a second generation in August/ September and even a third generation in hot southern places. 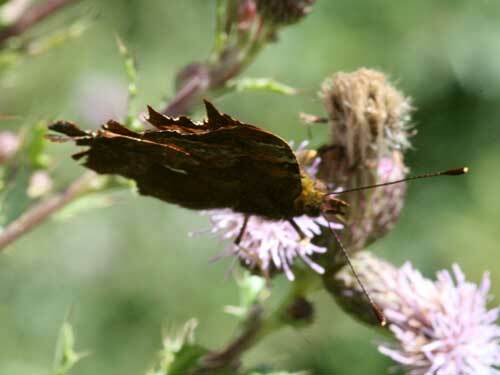 The latter group is pale in colour and this form is known as hutchinsoni. 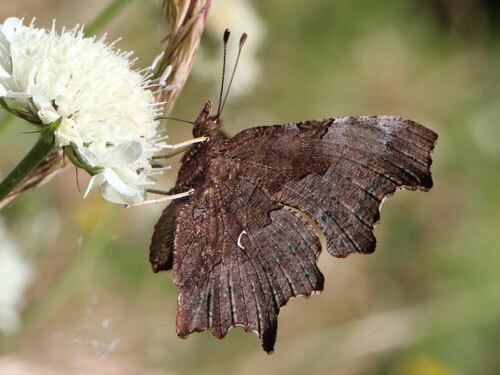 It appears that in favourable seasonal conditions, more larvae of the first brood become hutchinsoni and go on to form a large second brood. 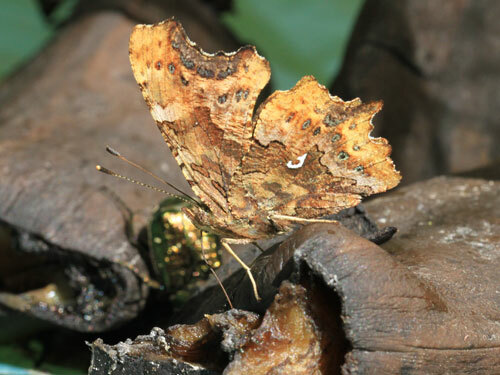 The inverse is true if first brood larvae experience poor conditions. 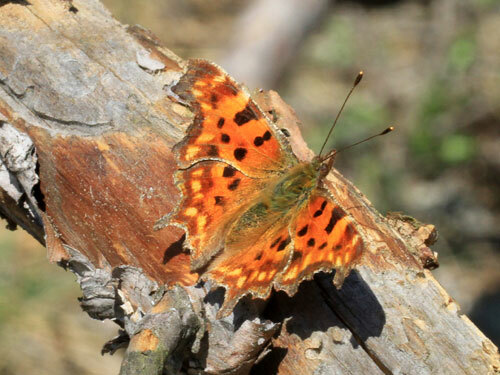 Habitat & Behaviour: Bushy wooded places, gardens. 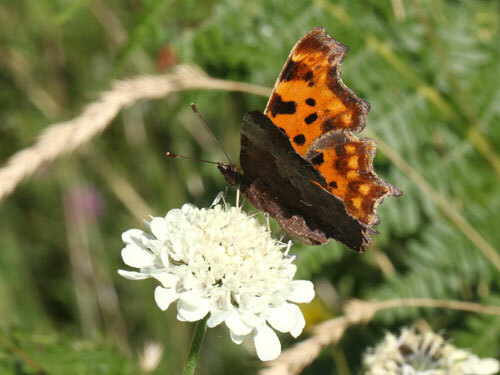 Feeds on flowers such as sallow Salix in spring, thistles etc. 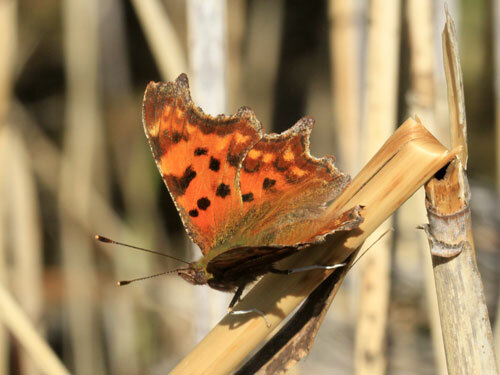 in summer and on rotting fruit in the autumn. 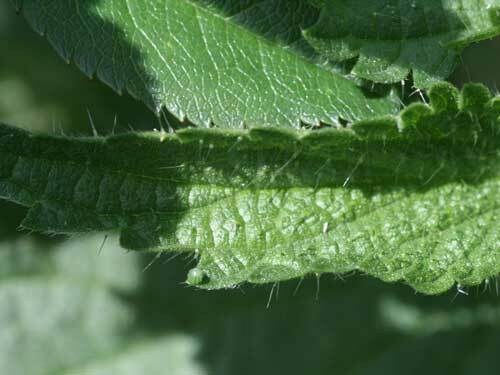 Inner margin of fw: deeply curved. Inner margin of fw: gently curved. 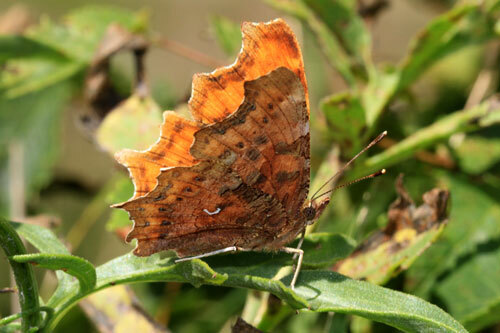 The outer scalloped edges of the wings splay out - contributing to the crinkled leaf appearance. 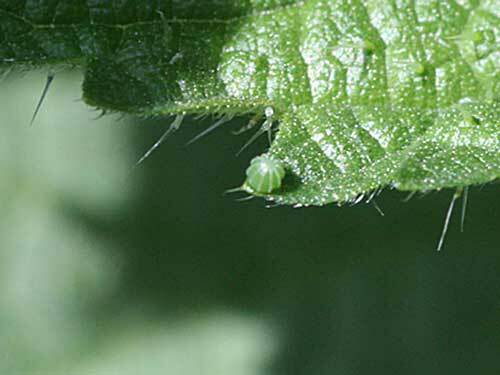 Egg laying on the upper edge of a stinging nettle, Urtica dioica, leaf. 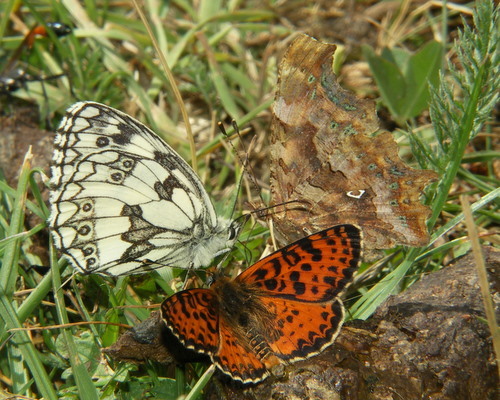 With spotted fritillary and marbled white, M. didyma and M. galathea. 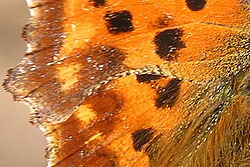 Deeply indented inner margin of wing. 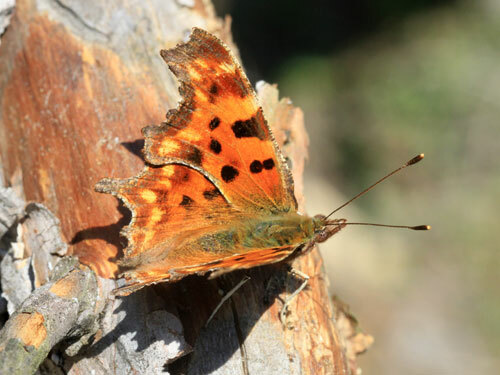 The white comma is clearly visible.